An undefeated team was absolutely throttled, looking completely inept in the process. A quarterback who’s generally been unimpressive early in his career busted out with a performance that any legend would be proud to claim. Chicago Bears fans have been waiting over a year to see their young quarterback break out. 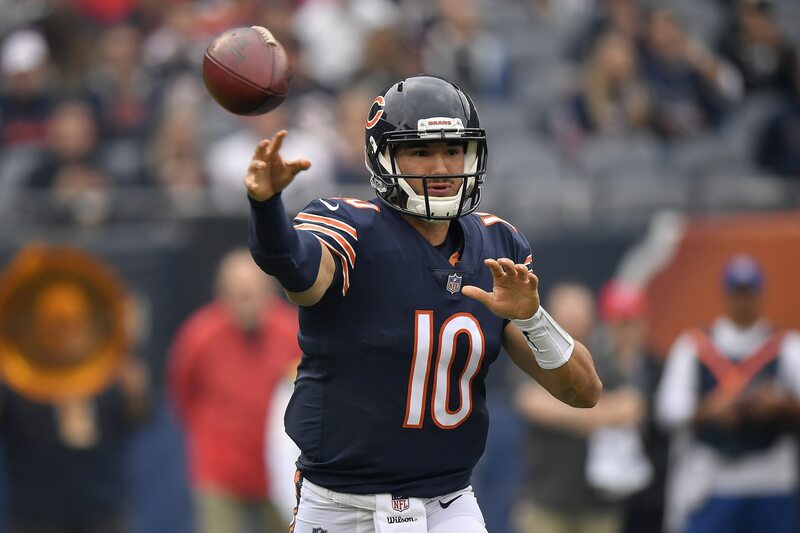 It finally happened on Sunday as Mitch Trubisky absolutely exploded with the kind of career game every quarterback wishes they could have once in their lifetime. There was a ton of offense in Sunday’s battle between AFC South rivals Houston Texans and Indianapolis Colts. The Texans cannot feel great about allowing Andrew Luck to go off the way he did, throwing for 464 yards with four touchdowns and no interceptions. His running mate, Jadeveon Clowney, also had a huge game on Sunday. He sacked Andrew Luck twice, had four tackles for a loss and scored a touchdown in the first half (watch here). Good defenses have been able to shut Jacksonville’s offense down on a pretty consistent basis in recent years. We saw it happen twice this year already, back in Week 1 and then again last weekend when Blake Bortles was thwarted by the Tennessee Titans. That’s not what happened on Sunday as the Jaguars hosted the New York Jets, however. Bortles had a field day picking apart Gang Green’s secondary, which absolutely forgot to cover T.J. Yeldon on his touchdown reception and was repeatedly burned by Dede Westbrook and Donte Moncrief. The New York offense was always going to get thrashed with a rookie on the road against the best defense in the league. But to see the Jets perform so poorly on the defensive side of the ball was surprising given how well they had previously done this year. The game in Atlanta between the Falcons and Cincinnati was full of big plays by both offenses. But for most of the contest receiver A.J. Green was held in check. Despite multiple injuries in Atlanta’s secondary, the Falcons did an outstanding job of doubling Green and limiting his impact. They just couldn’t keep it up with the game on the line. Down by five points, needing a touchdown to win, Cincinnati drove all the way into the Atlanta 13-yard line and had just 12 seconds left on the clock. Green broke loose in the right corner of the end zone, and Andy Dalton found him for the game-winning score (watch here). Green finished with just four receptions on the day, but he gained 78 yards and came through with the play of the game when his team needed him the most. One week after making a point of emphasizing the run and feeding rookie Saquon Barkley — a plan that led to New York’s first win of the season — the Giants abandoned that plan. The game against New Orleans never got out of hand until late. There were plenty of opportunities to establish balance on offense. Instead, Eli Manning ended up throwing the ball 41 times, while Barkley received just 10 carries. In total, Giants running backs carried the ball just 12 times. As good as Odell Beckham Jr. is, he isn’t the player the Giants need to run their offense through. Barkley is a generational talent and needs to be the focal point unless he’s getting shut down. That didn’t happen on Sunday — the Giants just refused to use him. Not long before the Seattle Seahawks kicked off against the Arizona Cardinals, Pete Carroll announced that starting running back Chris Carson would miss Sunday’s game with a hip injury. Instead of going with first-round rookie Rashaad Penny, the Seahawks turned to Mike Davis. And he shined. The fourth-year back out of South Carolina was the best offensive weapon on the field for either team. He rushed for 101 yards and two touchdowns on 21 carries and caught four passes for 23 yards. Those are numbers any starting back would be proud of, and his performance sparked a 20-17 win for the Seahawks. Colts rookie head coach Frank Reich comes from the Doug Peterson school of coaching, which means we can expect a certain amount of YOLO decisions. That certainly occurred Sunday in overtime, and it backfired in a big way. Facing a fourth-and-4 from their own 43-yard line, with 24 seconds left in overtime, Reich opted to play for the win rather than punting the ball away and playing for a tie. Unfortunately, when Andrew Luck failed to connect with Chester Rodgers, the Texans were set up for a perfect opportunity to win the game in enemy territory. Three plays later after Houston gained a first down on a DeAndre Hopkins reception, the Texans won the game with a 37-yard field goal. We applaud Reich for his boldness. Playing for the win over the tie is admirable. Unfortunately, it didn’t work out. One of the most frustrating things that has unfolded early this season is that the Dallas Cowboys have insisted on making Dak Prescott the centerpiece of their offense. On Sunday at home against the Detroit Lions, they finally rectified this by feeding Ezekiel Elliott. To nobody’s surprise, the Feed Zeke approach worked! Elliott received 25 carries and caught four passes on four targets. He worked magic on those 29 touches, going for 240 total yards and a touchdown. His last reception set up the ‘Boys for the game-winning field goal, too. Elliott is the best player on Dallas’ roster, regardless of position. Offensive coordinator Scott Linehan needs to continue to feed this young man, week in and week out. The Pittsburgh Steelers and Baltimore Ravens went into halftime all knotted up at 14 points apiece, and as we’ve seen the past two games Ben Roethlisberger was dealing. Big Ben competed 19-of-29 passes for 224 yards and a touchdown to Antonio Brown (thanks to a gorgeous catch by the star receiver) in the first two quarters. Then he came out and couldn’t hit the broad side of a barn with a handful of rice throughout most of the second half. In particular, his rapport with Brown continues to be tenuous, at best, which has been an ongoing problem for much of the first quarter in 2018. Even counting some garbage-time yardage, Roethlisberger finished with 50 yards on 8-of-18 passing with no touchdowns and a terrible interception in the second half. Without a running game to speak of, the Steelers had no chance to stay in this game, much to the chagrin of their hometown fans. Sunday night’s putrid performance also marked the second consecutive week in which the Steelers failed to score a single point in the second half. It’s almost like they miss a certain superstar, in the worst possible way. Coming out of college, Corey Davis was a dynamo. Yet the Tennessee Titans didn’t really see much from the No. 5 overall pick last year, and through three games in 2018 he was nothing more than a complementary player. That changed in a big way on Sunday as the Titans defeated the Philadelphia Eagles in overtime. Davis hauled in nine passes for 161 yards and a touchdown. The touchdown just so happened to be the game-winner with time expiring in overtime, too. This marked the first 100-plus-yard game for Davis as a pro, and he hauled in his first regular-season touchdown. It couldn’t have come at a better time. Heading into Sunday, only one No. 1 overall pick had won his first NFL start on the road — John Elway back in the first week of the 1983 season. That is a mark that still stands, as Baker Mayfield and the Cleveland Browns dropped a heart-breaker to the Oakland Raiders in overtime. This was a winnable game, too. Obviously. Unfortunately, the Browns just made too many mistakes, and that starts with Mayfield, who turned the ball over four times. Two of them came on botched snap exchanges between the quarterback and center JC Tretter. The other two were interceptions, the first of which was a pick-six on the offense’s second drive of the game. Cleveland’s defense also deserves plenty of criticism for allowing 565 yards of offense. But in the end it’s the quarterback who needs to pick up the slack for his teammates. Mayfield has the tools to do this in the future, but Sunday was not a high point for the rookie. As an aside, the Browns might have still won if not a strip/sack by Myles Garrett that was overturned on a terrible call by the refs. Earlier, the Giants’ refusal to feed Saquon Barkley was highlighted as a big negative. Big Blue should take a page from the Saints’ playbook after watching Alvin Kamara take over Sunday’s game to lead New Orleans to a 33-18 win on the road. The second-year back continues to amaze. He carried the ball 19 times during Sunday’s win, going for 134 yards and three touchdowns on the ground. And of course, as we’ve grown to expect, Kamara was also a factor as a receiver, hauling in five passes for 47 yards. This balanced offensive approach has made the Saints so much more dangerous the past year-plus. The Detroit Lions lost on Saturday, but you can’t blame rookie running back Kerryon Johnson. Following up the team’s first 100-plus-yard rushing performance in 70 games last weekend, Johnson was once again electric against the Cowboys. The rookie out of Auburn rushed for 55 yards on nine carries. He also punched in a very impressive touchdown, running over safety Jeff Heath in the process. Just like last weekend, however, the Lions continue to insist upon a timeshare backfield, with Johnson spitting carries with the ineffective veteran, LeGarrette Blount. It’s time to give Johnson the lion’s share of work on the ground and let the rookie work. For the first time this season, the Raiders were not outscored by their opponent in the second half. Not coincidentally, they won their first game on Sunday against the Browns. Derek Carr would love to have a couple of passes back, but he put up gaudy numbers in a winning cause and made key throws in overtime that led to the victory. Marshawn Lynch turned back the clock with his best regular-season outing since 2014, rushing for 130 and totaling 157 yards. The Raiders still have plenty of concerning issues they need to clean up. But a win is a win, no matter how ugly. The Arizona Cardinals had an excellent opportunity to beat a divisional rival for their first win of the season at home against the Seattle Seahawks. The game was ugly for both teams, but Dawson’s mistakes stand out as particularly glaring. The veteran kicker missed two of his three field-goal attempts. The first was right at the end of the first half when he failed to convert a 50-yard attempt. If he’d made this, then the Cardinals would have tied the game, 10-10 heading into halftime. Then at the end of the game, following an impressive 12-play drive engineered by rookie quarterback Josh Rosen, Dawson shanked a 45-yarder that would have given the Cardinals the lead with under two minutes to play. Seven plays later, Sebastian Janikowski did convert, giving the Seahawks a 20-17 win. The past three weeks, the Los Angeles Chargers have relied a heck of a lot on Melvin Gordon to make things happen on offense. Heading into Sunday’s game at home against the San Francisco 49ers, Gordon had scored four touchdowns in the previous two games. In Week 4, he was dominant on the ground, piling up 104 yards on 15 carries. As we’ve seen more and more, Gordon was a key receiver for the Chargers as well, catching seven passes (tying Keenan Allen for the most in the game) for 55 yards and one of Philip Rivers’ touchdowns. His strong play was key to the Chargers eking out a narrow 29-27 win over the scrappy 49ers. We already covered just how awful the Tampa Bay defense was by virtue of highlighting how unstoppable Chicago’s offense was. As if that weren’t bad enough, Tampa Bay’s offense collapsed under the weight of FitzMagic gone bad. Ryan Fitzpatrick was under siege throughout the first half as Khalil Mack and Co. brought pressure, and he threw a costly interception before being benched in favor of Jameis Winston. Then, on Winston’s first drive since being reinstated from his suspension, he threw an interception as Mack applied pressure once again (watch here). All told, the Bucs managed just one touchdown, and that one came late. Given the excitement that Sunday brought, it was easy to forget that, just a few days ago, Jared Goff was spitting white-hot fire. In a game that saw Kirk Cousins put on a show against the vaunted Los Angeles defense, Goff continued to one-up his opponent. He finished with 465 yards, five touchdowns and a perfect passer rating to lead the Rams to an incredible 38-31 victory over the Minnesota Vikings, making perfect throw after perfect throw along the way. One week after going into Minnesota and shredding the outstanding Vikings defense, Josh Allen reverted back to the form that had so many people cringing throughout the draft process and into the summer. Allen was a confused mess of a quarterback going up against the Green Bay Packers. He completed less than half of his passes, threw two interceptions, was sacked an astonishing seven times for 64 yards and lost a fumble. Some of that is certainly on his offensive line, but Allen also put himself in bad situations by not recognizing where pressure was coming from. In the end, his Bills were shut out by the Packers, 22-0.